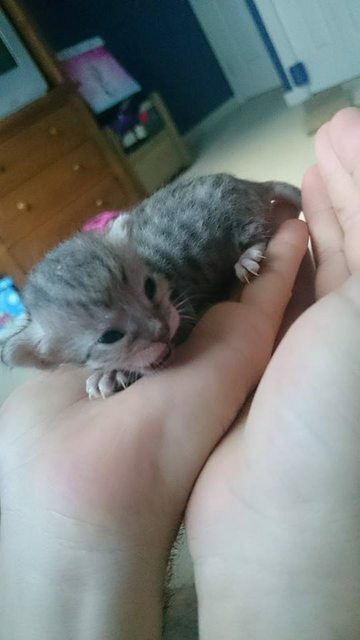 A young woman found the smallest kitten ever, still alive, with a beating heart. It was hard for her to believe that something so small could still be alive. Nuuudel was the kind hearted woman who talked about her amazing discovery. 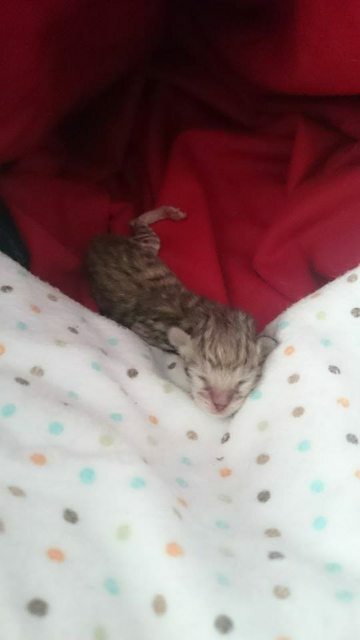 It turned out that the little kitten weighed no more than forty grams, and most kittens this size never survive, but they didn’t give up hope! Not much bigger than a small coin! 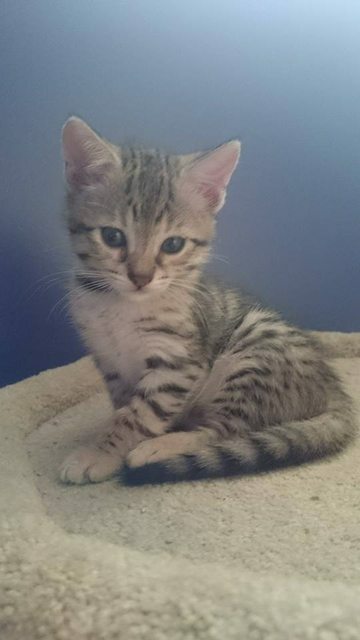 Nuuudel took a photo of the kitten. 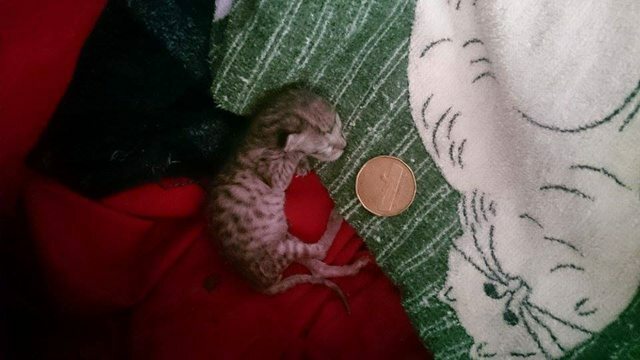 Her tiny little head wasn’t much larger than a loonie, the Canadian coin for $1. 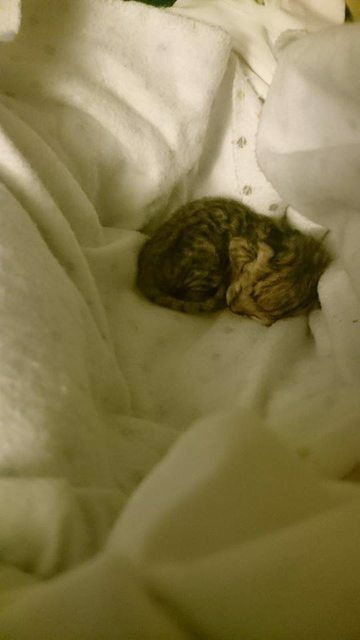 She took the photo to the vet, where she was told that they had never seen such a tiny kitten survive. 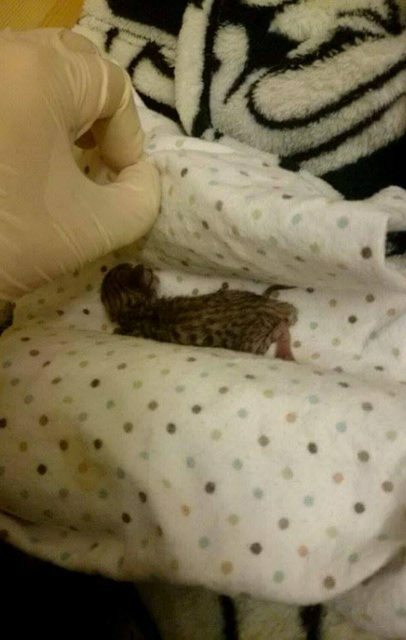 The woman and her partner decided they’d do everything they could to save the kitten. At the time they thought Titan was a boy, hence the name. They felt the name was apt—He would live or die as a Titan would. Later, they discovered he was a she, but the name stuck. VERY SMALL—Not much larger than a credit card! Nuuudel and her partner cared for the kitten, cleaning her, and making her feel warm and feeding her once an hour. 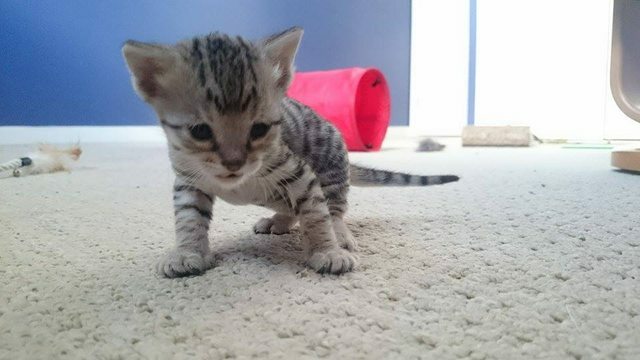 She didn’t move much in her first week, nor gain any weight. 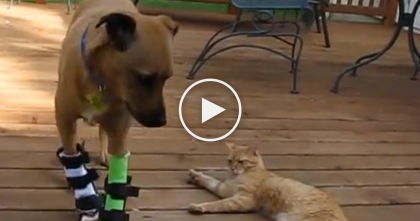 The couple fretted about doing the right thing, but they decided to not give up hope just yet! They finally heard something on the eighth day, they couldn’t believe it! On the eighth day, they woke up to an amazing sound. Little Titan was meowing. It was 3 am, and they were a bit worried. Was she in pain or uncomfortable? She was scrambling around her small bed. They discovered that the little kitten was actually hungry. She howled, then grabbed onto the kitten-formula-filled syringe and ate enthusiastically. A well-deserved nap after eating! It was like having a newborn child. The couple barely slept over the next two weeks. They looked after Titan, and made sure she ate, even if they forgot to eat, themselves, but thankfully little Titan was finally gaining some weight! 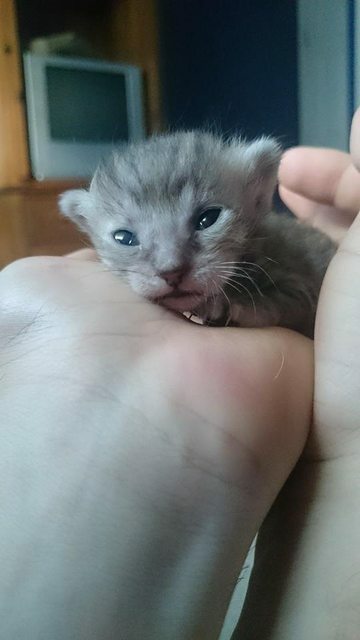 Little Titan’s eyes opened with an expression of gratitude for humans who never gave up! Within another couple of weeks the couple realized that Titan was actually a girl. Her eyes opened and the couple were overjoyed. 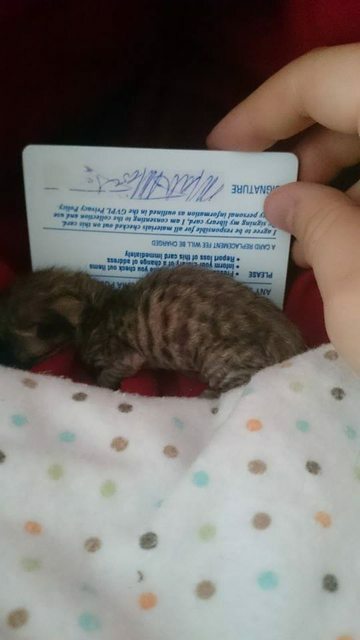 She still had trouble getting around, and was underweight for a kitten of her age. Titan rewarded the human by wanting food and pets. Ready to explore—Titan kept growing! Titan was eager to explore, but she’d get scared too quickly. The vet was worried she may be blind. 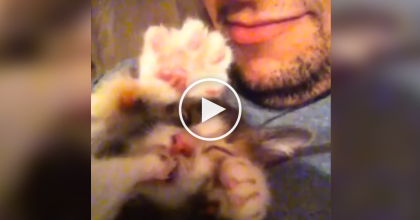 The couple didn’t have to feed her as often, giving them more time for kitten care. They got her used to being handled. 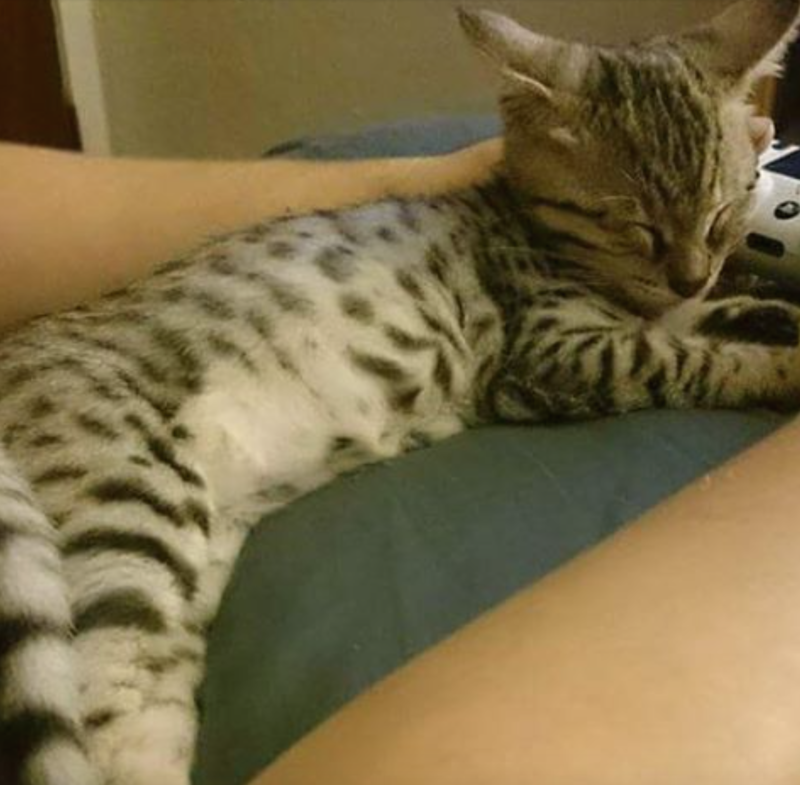 By six weeks, Titan had made incredible progress, and was starting to act like a normal kitten. She was ready to play. Titan ended up being anemic, but the couple helped her through the rough times. At sixteen weeks, Titan had put on a lot of weight, and was starting to look healthy. She still needed extra care and tests, but her humans were there to help her as she became bigger and stronger. Everyone else was ready give up on little Titan, but not these kind humans! Today Titan is a full-size healthy cat. And look at those tabby markings—gorgeous! She still enjoys chasing her toys around and thanks her humans each day that they gave her the chance and the love to never give up! 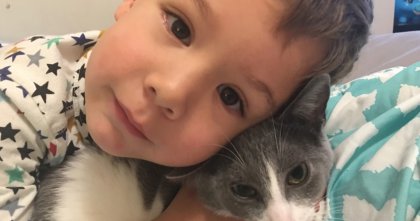 We’re SOO glad someone loved Titan—Please SHARE this rescue story! 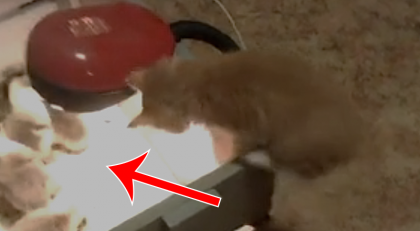 They Heard Something Rummaging In A Bag, But When Took A Closer Look… The Ending Is Amazing!